21 years before the Chevy Volt dance was another General Motors marketing spectacle during the 1988 Chicago Auto Show. This time, for the Chevrolet Cavalier. Performing were The Chevy Footlockers – which were clad in a pseudo Chippendale garb with sleeveless shirts and bowties. And because it was the 1980’s – mullets and mustaches abound. There was no logical connection between the stage show and the car that they were representing. Or even the shoe store of the same name as the dance team. Just a single word off from Toyota’s longstanding “Let’s Go Places” mantra, the Holden marketing slogan that emerged in 2015 has been criticized as unoriginal and vapid by the media and the public alike, offering little to no representation of what Holden has stood for. Moreover, the slogan echoes a theme within Australia’s floundering vehicle brand, which has been in disarray since ceasing manufacturing operations in the country a year ago. Even bigger a sting is a child’s rendering of the “next generation Holden Commodore” in the ad, which depicts a wildly designed supercar with scissor doors. A wild departure from what Aussies actually got. 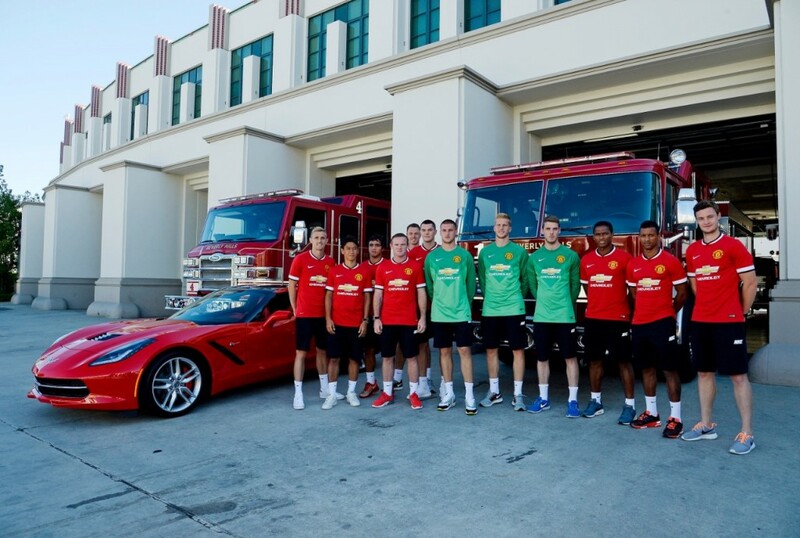 In 2012, Chevrolet unexpectedly announced a blockbuster $559 million jersey sponsorship deal with legendary British soccer team Manchester United, one of the biggest deals in the history of the sport, and is scheduled to run until 2021. 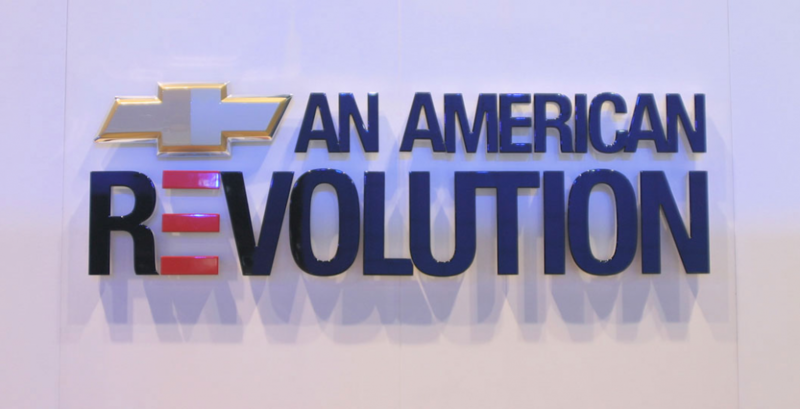 But it seemed that then-General Motors marketing chief Joel Ewanick wasn’t told of the company’s plans to evaporate Chevrolet’s presence out of Europe that would be announced a year later. Or perhaps he did, and still found it right to sign over $550 million for a soccer jersey, leaving everybody to rationalize the deal based on Chinese-market Manchester United fans, because the high-budget decision is what’s believed to have ultimately got him fired. His dismissal has left General Motors marketing without a czar ever since. 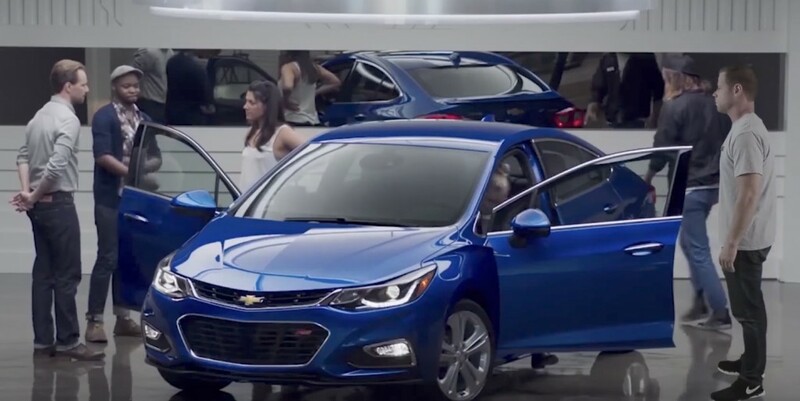 It can be strongly debated as to whether or not General Motors marketing actually needs a CMO. Each brand enjoy their own vice presidents of marketing, who seem to independently steer the branding directions of their respective labels – which can be a positive thing. And when a CMO is capable of carrying out infamous decisions such as the one outlined above, why bother paying somebody for the job? Well, a good CMO could either support or balance out the decision making of the brand VPs, and thus galvanize a proposed marketing strategy, or flatly delete one before it’s too late. Some pundits have argued that GM’s current executive team fundamentally do not believe in the power of creative marketing and advertising, and have instead emphasized headline-making moves such as autonomous vehicle development and other hip offerings such as Maven car sharing to boost brand cachet. As a result, General Motors marketing efforts have become what the focus group data tells them to do, or some overreaching effort that demonstrates little to no fundamental understanding of a brand. Because creativity is not quantifiable, and thus deemed either too risky or unnecessary by the bean counters. Young people. Various vehicle body styles. Families. Pets. The feeling of surprise. Matt & Kim. “That’s a Buick” seems to have worked with strong effect in attracting new, younger buyers into the fold. “That’s A Buick!” (also interpreted “That’s A Buick?”) has steadily delivered on a consistent theme of light-hearted advertisements that have slowly massaged unfamiliar consumers into realizing that it’s no longer a brand that only offers fluffy three-box sedans with fake portholes over the front fenders. For this, we give it a salute. Even more effective than the Buick marketing efforts have been from GMC, and it shows what steady, unchanged, and confident marketing can do for building a brand. We’d even make the case that GMC has the best marketing out of every General Motors vehicle. “Like A Pro” is well done, too. And at every presentation, marketing is always a focal point, and the GMC team has it down to a molecular science. How else can people be convinced to exchange over $70,000 for a topped-out 2019 Sierra Denali? Say what you will about the quality of the movie franchise, the 2007 blockbuster film did more to get kids into cars than virtually any General Motors marketing effort before or since. 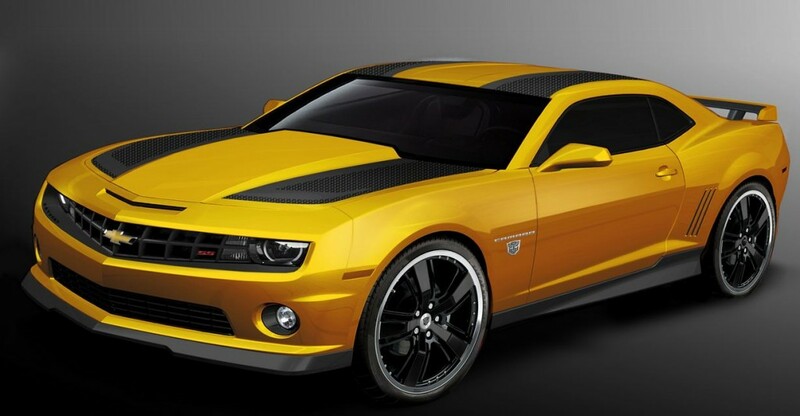 Bumblebee, originally a VW Bug, is synonymous with the Chevrolet Camaro now for millions of kids growing up 10 years ago. Another Chevy became a poster car. Too bad the movies kept getting worse, but that’s not GM’s fault. This was simply a great slogan. Probably the best from Chevrolet over the past 30 years. Bob Seger! Chevrolet seems to be re-capturing a bit of this old magic with the theme of Truck Legends, but nothing replaces the original. The ads were always full of feeling and the imagery made field work seem romantic and full of drama – far away from a condescending Dennis Leary voice, and a campaign that was never lampooned, unlike Real People, Not Actors. Let us know your thoughts in the comment section below, and whether or not we may have missed something. GM needs to get back to the good ads. Some of the stuff they have come up with lately is just a waste of good money. If you have something that work stick with it and don’t replace it with junk. I had never seen the Chevy Footlockers. Glad they kept their shirts and pants on! Although sometimes if you’re going to make a blunder it’s, no pun intended, best to go big! As for good campaigns, “The Heartbeat of America” was pretty great as well. But I disagree about “That’s a Buick.” It implies there’s a negative connotation, or stigma, associated with the brand. Like a Rock needs to come back. That was not a home run that was a total rout of the freaking World Series of automotive marketing. Tell me when Seger is on the radio you do not think Chevy trucks. Like a Rock is playing in my head now. Won’t stop either, dammit. Seger should get royalties from GM every time someone plays it on the radio. What no heartbeat of America?!? 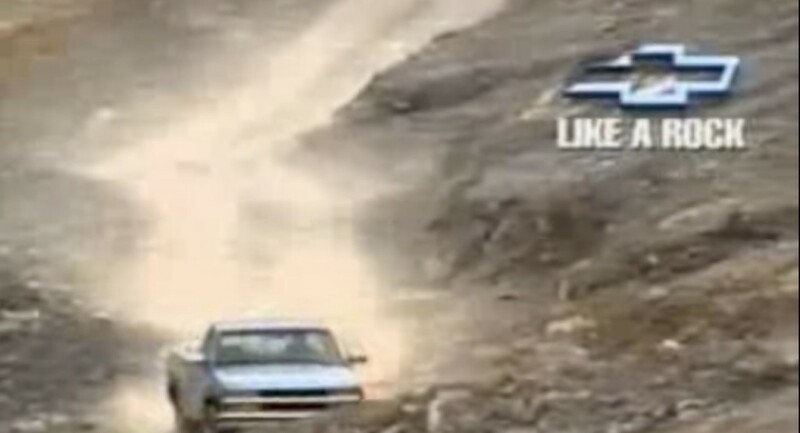 Like a Rock was IMO the best automotive marketing campaign ever. Sure it conveyed toughness and was usually complete with a visual of a truck bouncing (hard) through some kind of off road setting, but it more importantly conveyed a sense of attachment, your truck was your buddy who wasn’t going to let you down. As bland and boring as marketing seems to be now it is no wonder millenials don’t have any attachment or love for their vehicles any more. And those Dennis Leary “hey stupid” Ford truck commercials are annoying as F.
Millennials have human beings for friends, and you folks get all emo over your truck, like a rock for you. And the Millenials are the dumb ones apparently…. I miss the James Garner narrations too. Good voice for truck ads. They also did well with USA 1 but that was farther back. Same See the USA in a Chevrolet. GM should not most of the most r3membered programs were from much farter back. Pontic Wide Track and Pontiac Builds Excitment both were used in this era and both garnered much attention. One of the worst was The First G6. I see Cadillac is trying to use this lame line on the XT4. Eiffel Tower, garçon, no more profits and Opel’s sold! I blogged something about this in the last couple weeks. 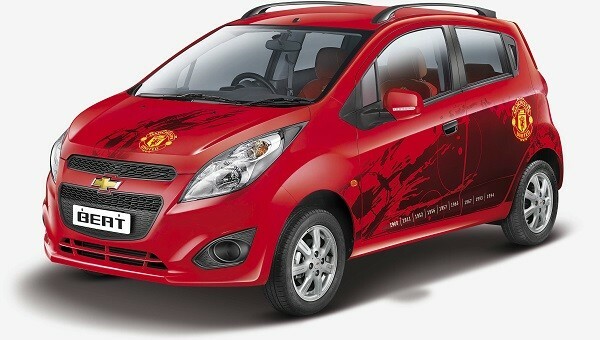 About Chevrolet losing their passion for their own products! Andy, Dave, scott3, you make good points and yes VCAT, why change for the sake of change? I know we are told we live in a global economy but products are sold regionally within that globe and the bland “J D Power” commercials or “look at all the tech in the Equinox” don’t really hit the mark for a lot of folks. I do not place all the blame on GM. To be honest the Advertising segment is not like it used to be. It is sad some of today’s best marketing is from the My Pillow guy and Flex Seal guy. I hate these commercials but the are moving product. Flow has done well for Progressive but I’d now past the peak. Good marketing plants seeds that grow with people or stick to them. Songs, images and sights sell. The hard part is finding those points that are effective. 1 out of 1000 ads are effective. The traveling shows were fun and GM had the ride and drives not that long ago. But they are expensive and move little product. One I went to let me drive GM and Competing cars. Autocross a Z06 and CTSv. Off road a Hummer, fed me lunch and gave me a shirt. I had a blast but it was 5 years till I bought a car. I am not against trying new things,. But if they don’t work what’s wrong with going back to the things that did work? I realize you can’t do that with everything but we are talking ads here. Like many have said there are many ads that still stand out but they are all or most from long ago. That can hardly be said about most of the new ads. I wonder if a new version of that old GM traveling roadshow would work in this day and age. Technology makes everything available at the touch of a button and there is a lot of talk that car shows in the current form is not working anymore, for instance the Detroit show. What if “The Chevy Show” came to town and showed off? Would it help inspire passion for driving again and create excitement about a brands vehicles? Reality versus virtual reality? I remember my Dad talking about seeing that GM “motorama” back in the early ’50’s maybe and he always seemed won over by it. Even 50 years later. I don’t know, something old is new again might work. The real people, not actors is just lame. Actually, it’s just horrible. Bring back Like a Rock, it never should have been dumped or else revive the Heartbeat of America. This new gig with the real people not actors is pathetic and has grown old in a real hurry. Bob Seger’s “like a rock” was representative of solid GM product. The trucks made at that point were not a blend of multiple brand’s styling ques. A Chevrolet truck looked like a Chevy truck; not an off shoot of Ford headlight design. Toyota bedsides, etc. On a separate note, the Malibu is loosing sales because of the engine selection and the reduced warranty. I don’t want a tiny 4 cylinder with a turbo to make the hp. I recently purchased a new car in that class and paid a premium for the v6. I know the technology is there to get good mileage and power. The manufactures’ (GM) need to stand behind them if they want to keep my brand loyalty. And finally, where is the 2 door Malibu? If you don’t think there is a market, try pricing a 200k+ mile 2 door cobalt or cavalier. You are missing a great opportunity to get young people in your cars.